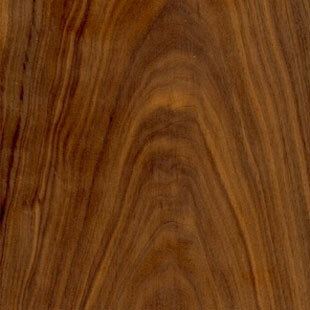 The sapwood of walnut is creamy white, while the heartwood is light brown to dark chocolate brown, occasionally with a purplish cast and darker streaks. Walnut is usually supplied steamed, which darkens the sapwood, but a very unique look can also be achieved by leaving it natural. The wood is generally straight grained, but sometimes with wavy or curly grain that produces an attractive and decorative figure. The dark heartwood will lighten in color as it ages overtime with exposure to UV light. Throughout Eastern USA, but principal commercial region is the central United States. One of the few American species planted as well as naturally regenerated. Reasonable availability in both lumber and veneer.